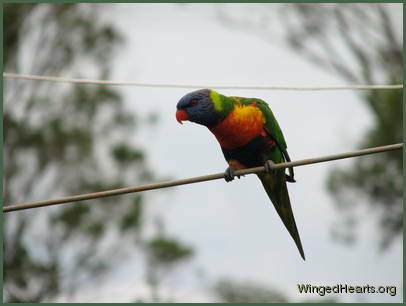 A cloudy day and the rainbow lorikeets are flying over to the fruit trees in the neighbouring paddocks. 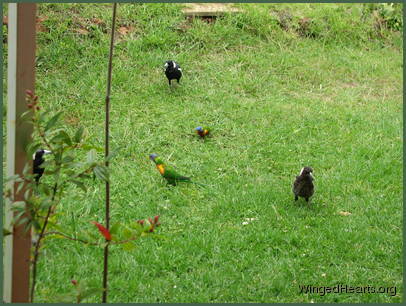 Our mulberries have long been eaten and we haven't seen our old friends for some weeks now. 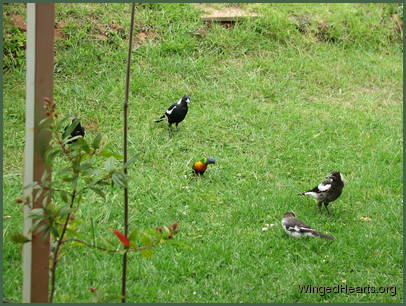 The magpies and butcherbirds have been chatting. Wendy magpie is now two years old and almost fully adult colours. Except for her size which is slightly bigger than Sophie, she is really hard to distinguish from her older sister, especially from a distance. 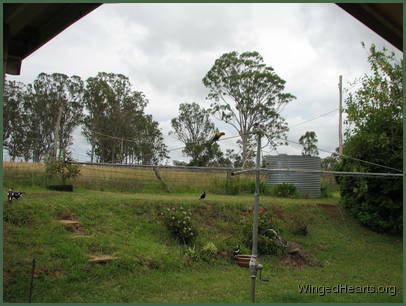 Kerry butcherbird too is two years old and almost adult colours and similarly difficult to tell apart from his older brother Dimpy (now three years old) , all except for their different signature songs by which they announce themselves. I wonder which one of our young adults is going to venture abroad first. I so hate having to say goodbye to any of them, and console myself with the knowledge that they are leading full bird lives and love their travels, adventures, lifestyle and freedom. March-April are the months when the older kids leave home and I hope like their siblings before them they are going to tell us when they are ready to leave and show us which direction they are headed. 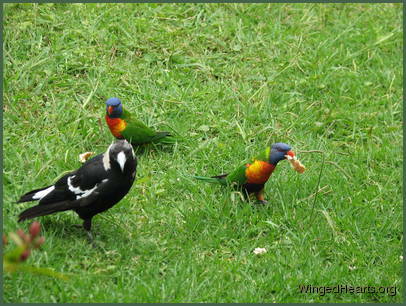 The bolder of the pair decided to hop down and join Wendy and gang on the grass. 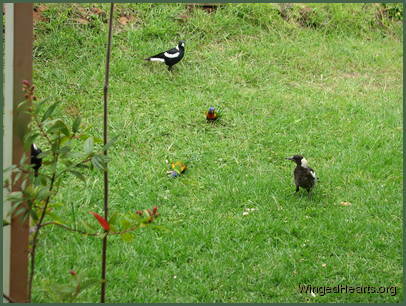 The magpies and butcherbirds didn't seem to mind at all and soon the shier lorikeet joined her mate. I kept thanking all of them as I zoomed the lens into focus and took as many shots as I could. 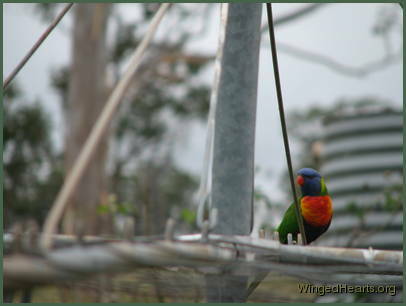 The lorikeets sampled some bread and our regulars let them with no protest or attitude. 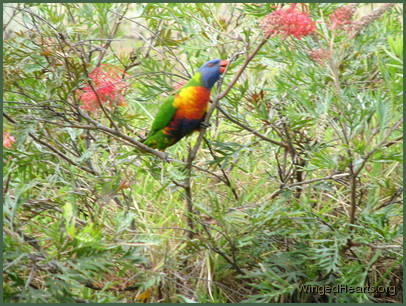 The lorikeets were their guests and friends. 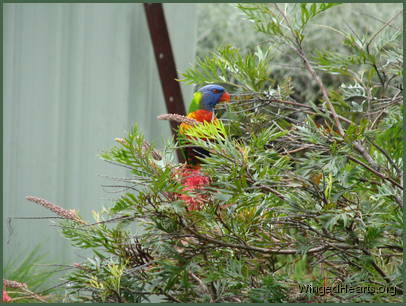 Not only did they know each other from the mulberry tree, but they also shared the trees in the bush. When Wendy left decided to try a sip of the nectar as well. 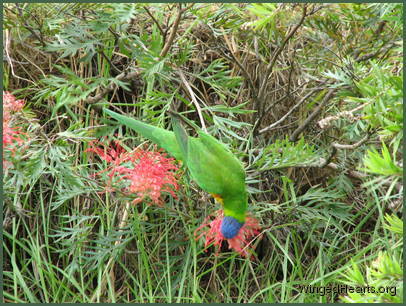 Chimpkin was a bit surprised as the lorikeets had never sat on the grevillea shrubs before. 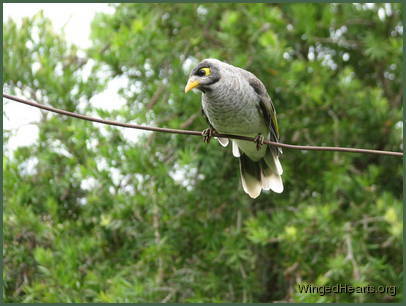 But the noisy-miner too treated them as guests and didn't put on their normal territorial 'this is my shrub' behaviour. 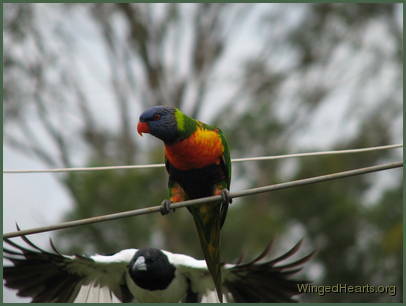 The lorikeets had a really good drink to wash down their bread, while Chimpkin sat on the line. Sadly, I ran out of memory card at that point and put the camera down. 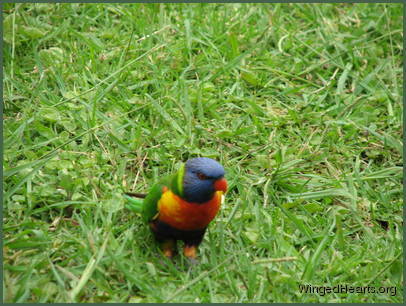 The lorikeets seeing they had no 'big eye' to pose for, continued to other paddocks. Vicky, Dimpy and Chimpkin looked at me with great pride - had they not done the right thing by making the lorikkets feel welcome and letting me photograph them all? I thanked all my birds. They never cease to amaze me. 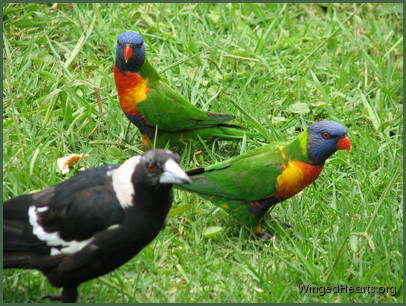 Previous Slide 1/14 NextRainbow Lorikeets Drop InLet's stop by our friends this morning They look like they're having fun I know I can trust them I don't think they'll mind if I join in The lady has brought a big eye - but that is no problem The magpies and butcherbirds are happy to say hello They don't mind us pottering through their treats They all know us after all Vicky lets them taste some bread Even the noisy-miners are letting us enjoy a drink from their from their favourite grevillea bushes and we love posing for the lady with the 'big eye'!